We point out that the s-channel unitarity of QCD imposes meaningful constraints on a possible form of the QCD Reggeon Field Theory. We show that neither the BFKL nor JIMWLK nor Braun’s Hamiltonian satisfy the said constraints. In a toy, zero transverse dimensional case we construct a model that satisfies the analogous constraint and show that at infinite energy it indeed tends to a “black disk limit” as opposed to the model with triple Pomeron vertex only, routinely used as a toy model in the literature. A.H. Mueller and B. Patel, Single and double BFKL Pomeron exchange and a dipole picture of high-energy hard processes, Nucl. Phys. B 425 (1994) 471 [hep-ph/9403256] [INSPIRE]. A.H. Mueller, Unitarity and the BFKL Pomeron, Nucl. Phys. B 437 (1995) 107 [hep-ph/9408245] [INSPIRE]. L.N. Lipatov, Small x physics in perturbative QCD, Phys. Rept. 286 (1997) 131 [hep-ph/9610276] [INSPIRE]. L.N. Lipatov, Gauge invariant effective action for high-energy processes in QCD, Nucl. Phys. B 452 (1995) 369 [hep-ph/9502308] [INSPIRE]. J. Bartels and C. Ewerz, Unitarity corrections in high-energy QCD, JHEP 09 (1999) 026 [hep-ph/9908454] [INSPIRE]. 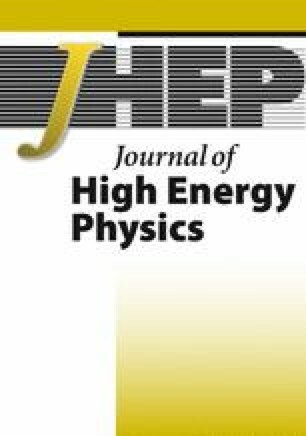 C. Ewerz, Reggeization in high-energy QCD, JHEP 04 (2001) 031 [hep-ph/0103260] [INSPIRE]. A.H. Mueller and G.P. Salam, Large multiplicity fluctuations and saturation effects in onium collisions, Nucl. Phys. B 475 (1996) 293 [hep-ph/9605302] [INSPIRE]. G.P. Salam, Studies of unitarity at small x using the dipole formulation, Nucl. Phys. B 461 (1996) 512 [hep-ph/9509353] [INSPIRE]. Y.V. Kovchegov and E. Levin, Diffractive dissociation including multiple Pomeron exchanges in high parton density QCD, Nucl. Phys. B 577 (2000) 221 [hep-ph/9911523] [INSPIRE]. M. Braun, Structure function of the nucleus in the perturbative QCD with N c → ∞ (BFKL Pomeron fan diagrams), Eur. Phys. J. C 16 (2000) 337 [hep-ph/0001268] [INSPIRE]. M.A. Braun and G.P. Vacca, Triple Pomeron vertex in the limit N c → ∞, Eur. Phys. J. C 6 (1999) 147 [hep-ph/9711486] [INSPIRE]. J. Bartels, M. Braun and G.P. Vacca, Pomeron vertices in perturbative QCD in diffractive scattering, Eur. Phys. J. C 40 (2005) 419 [hep-ph/0412218] [INSPIRE]. J. Bartels, L.N. Lipatov and G.P. Vacca, Interactions of reggeized gluons in the Mobius representation, Nucl. Phys. B 706 (2005) 391 [hep-ph/0404110] [INSPIRE]. M.A. Braun, Nucleus-nucleus scattering in perturbative QCD with N c → ∞, Phys. Lett. B 483 (2000) 115 [hep-ph/0003004] [INSPIRE]. M.A. Braun, Nucleus nucleus interaction in the perturbative QCD, Eur. Phys. J. C 33 (2004) 113 [hep-ph/0309293] [INSPIRE]. M.A. Braun, Conformal invariant Pomeron interaction in the perurbative QCD with large N c, Phys. Lett. B 632 (2006) 297 [hep-ph/0512057] [INSPIRE]. I. Balitsky, Factorization and high-energy effective action, Phys. Rev. D 60 (1999) 014020 [hep-ph/9812311] [INSPIRE]. Y.V. Kovchegov, Small x F(2) structure function of a nucleus including multiple Pomeron exchanges, Phys. Rev. D 60 (1999) 034008 [hep-ph/9901281] [INSPIRE]. A. Kovner and M. Lublinsky, Odderon and seven Pomerons: QCD Reggeon field theory from JIMWLK evolution, JHEP 02 (2007) 058 [hep-ph/0512316] [INSPIRE]. J. Jalilian-Marian, A. Kovner, A. Leonidov and H. Weigert, The BFKL equation from the Wilson renormalization group, Nucl. Phys. B 504 (1997) 415 [hep-ph/9701284] [INSPIRE]. A. Kovner and J.G. Milhano, Vector potential versus color charge density in low x evolution, Phys. Rev. D 61 (2000) 014012 [hep-ph/9904420] [INSPIRE]. A. Kovner, J.G. Milhano and H. Weigert, Relating different approaches to nonlinear QCD evolution at finite gluon density, Phys. Rev. D 62 (2000) 114005 [hep-ph/0004014] [INSPIRE]. H. Weigert, Unitarity at small Bjorken x, Nucl. Phys. A 703 (2002) 823 [hep-ph/0004044] [INSPIRE]. E. Ferreiro, E. Iancu, A. Leonidov and L. McLerran, Nonlinear gluon evolution in the color glass condensate. 2., Nucl. Phys. A 703 (2002) 489 [hep-ph/0109115] [INSPIRE]. A. Kovner and M. Lublinsky, In pursuit of Pomeron loops: The JIMWLK equation and the Wess-Zumino term, Phys. Rev. D 71 (2005) 085004 [hep-ph/0501198] [INSPIRE]. A. Kovner and M. Lublinsky, From target to projectile and back again: Selfduality of high energy evolution, Phys. Rev. Lett. 94 (2005) 181603 [hep-ph/0502119] [INSPIRE]. I. Balitsky, High-energy effective action from scattering of QCD shock waves, Phys. Rev. D 72 (2005) 074027 [hep-ph/0507237] [INSPIRE]. Y. Hatta, E. Iancu, L. McLerran, A. Stasto and D.N. Triantafyllopoulos, Effective Hamiltonian for QCD evolution at high energy, Nucl. Phys. A 764 (2006) 423 [hep-ph/0504182] [INSPIRE]. L.N. Lipatov, Reggeization of the Vector Meson and the Vacuum Singularity in Nonabelian Gauge Theories, Sov. J. Nucl. Phys. 23 (1976) 338 [Yad. Fiz. 23 (1976) 642] [INSPIRE]. S. Bondarenko and L. Motyka, Solving effective field theory of interacting QCD Pomerons in the semi-classical approximation, Phys. Rev. D 75 (2007) 114015 [hep-ph/0605185] [INSPIRE]. A.H. Mueller and A.I. Shoshi, Small x physics beyond the Kovchegov equation, Nucl. Phys. B 692 (2004) 175 [hep-ph/0402193] [INSPIRE]. E. Iancu and D.N. Triantafyllopoulos, A Langevin equation for high energy evolution with Pomeron loops, Nucl. Phys. A 756 (2005) 419 [hep-ph/0411405] [INSPIRE]. E. Iancu and D.N. Triantafyllopoulos, Non-linear QCD evolution with improved triple-Pomeron vertices, Phys. Lett. B 610 (2005) 253 [hep-ph/0501193] [INSPIRE]. E. Iancu, G. Soyez and D.N. Triantafyllopoulos, On the probabilistic interpretation of the evolution equations with Pomeron loops in QCD, Nucl. Phys. A 768 (2006) 194 [hep-ph/0510094] [INSPIRE]. A.H. Mueller, A.I. Shoshi and S.M.H. Wong, Extension of the JIMWLK equation in the low gluon density region, Nucl. Phys. B 715 (2005) 440 [hep-ph/0501088] [INSPIRE]. E. Levin and M. Lublinsky, Balitsky’s hierarchy from Mueller’s dipole model and more about target correlations, Phys. Lett. B 607 (2005) 131 [hep-ph/0411121] [INSPIRE]. E. Levin and M. Lublinsky, Towards a symmetric approach to high energy evolution: Generating functional with Pomeron loops, Nucl. Phys. A 763 (2005) 172 [hep-ph/0501173] [INSPIRE]. P. Rembiesa and A.M. Stasto, Algebraic models for the hierarchy structure of evolution equations at small x, Nucl. Phys. B 725 (2005) 251 [hep-ph/0503223] [INSPIRE]. A. Kovner and M. Lublinsky, More remarks on high energy evolution, Nucl. Phys. A 767 (2006) 171 [hep-ph/0510047] [INSPIRE]. A.I. Shoshi and B.-W. Xiao, Pomeron loops in zero transverse dimensions, Phys. Rev. D 73 (2006) 094014 [hep-ph/0512206] [INSPIRE]. M. Kozlov and E. Levin, Solution for the BFKL Pomeron Calculus in zero transverse dimensions, Nucl. Phys. A 779 (2006) 142 [hep-ph/0604039] [INSPIRE]. J.P. Blaizot, E. Iancu and D.N. Triantafyllopoulos, A zero-dimensional model for high-energy scattering in QCD, Nucl. Phys. A 784 (2007) 227 [hep-ph/0606253] [INSPIRE]. E. Levin and A. Prygarin, The BFKL Pomeron Calculus in zero transverse dimension: Summation of the Pomeron loops and the generating functional for the multiparticle production processes, Eur. Phys. J. C 53 (2008) 385 [hep-ph/0701178] [INSPIRE]. A. Kovner and M. Lublinsky, Dense-dilute duality at work: Dipoles of the target, Phys. Rev. D 72 (2005) 074023 [hep-ph/0503155] [INSPIRE]. E. Levin and K. Tuchin, Solution to the evolution equation for high parton density QCD, Nucl. Phys. B 573 (2000) 833 [hep-ph/9908317] [INSPIRE]. S. Bondarenko, L. Motyka, A.H. Mueller, A.I. Shoshi and B.W. Xiao, On the equivalence of Reggeon field theory in zero transverse dimensions and reaction-diffusion processes, Eur. Phys. J. C 50 (2007) 593 [hep-ph/0609213] [INSPIRE].